Free breakfast fully equipped kitchens and a fitness room are a few of the benefits you'll enjoy during your visit to the Extended Stay America - San Jose - Edenvale - South. This wallet-friendly comfortable location is ready to be your home away from home in south San Jose and Silicon Valley. Suites include fully equipped kitchens with stoves full-size refrigerators dishwashers and microwaves. Pets are allowed at this non-smoking three-floor 67-room property. Jump-start your day with a free grab-and-go breakfast that includes a variety of breakfast bars and muffins hot cereal coffee and tea. Guests are welcome to round out the day with a workout in the fitness center. Rooms include free Wi-Fi and free local calling with voicemail. Hotel services include a business center valet dry cleaning and ample free parking. 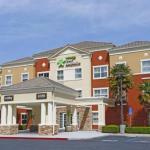 This Extended Stay America in south San Jose is located 12 miles from downtown and 14 miles from San Jose International Airport. It's two miles from the Blossom Hill Caltrain stop providing easy access to San Jose Palo Alto and San Francisco. Santa Teresa Golf Course is one mile from the hotel.